It is 1970, and a down-at-the-heels California commune devoted to peace, free love, and the simple life has decided to relocate to the last frontier—the unforgiving landscape of interior Alaska—in the ultimate expression of going back to the land. Armed with the spirit of adventure and naïve optimism, the inhabitants of “Drop City” arrive in the wilderness of Alaska only to find their utopia already populated by other young homesteaders. When the two communities collide, unexpected friendships and dangerous enmities are born as everyone struggles with the bare essentials of life: love, nourishment, and a roof over one’s head. Rich, allusive, and unsentimental, T.C. 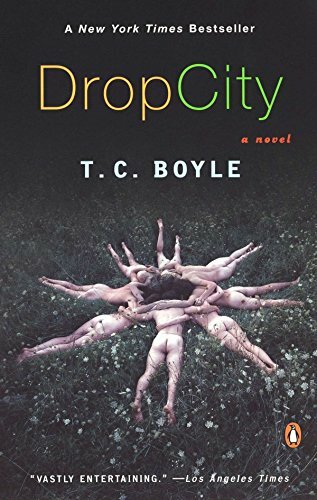 Boyle’s ninth novel is a tour de force infused with the lyricism and take-no-prisoners storytelling for which he is justly famous. Although I own a few of T.C. Boyle's novels, this is the first I've read. Although most people would consider me a pretty "straight" person, I've always had a kind of fascination with the hippie generation & this novel gave me a peek into commune living. Generally speaking, I know I could never live that way for lots of reasons, but it was enlightening to read about. As for the story itself, I found that it dragged a bit. Good characterization and detail & not so much dialogue, and I usually do have trouble plodding through such books. I couldn't get past the feeling of wondering what the point of the novel was. Although I thought the last 2-3 chapters were the best, it was left pretty open-ended. Arrived today safe & sound in Minnesota. I look forward to getting a chance to read this one soon. Thanks a bunch for sharing it with me Indy. Adding this to the OBCZ at BrightEyes Books. Thanks for sharing it with me.